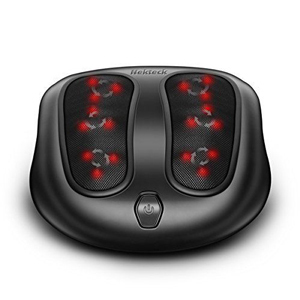 The Nekteck foot massager has an interesting design and it uses 18 massage nodes to relieve the tension and pain in your feet. This model has an adaptable height and it’s very easy to use. One of the advantages of using this model is that it uses 18 massage nodes to work the tense muscles in the soles of your feet. 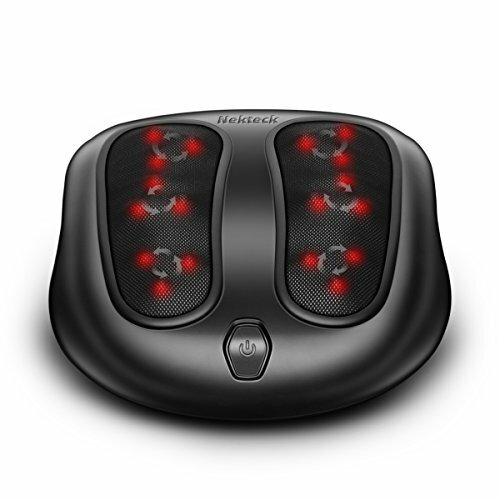 The Neckteck foot massager uses 3 massage heads for each of your feet. Every massage head comes with three massage nodes, so each of your feet will be massaged by 9 massage nodes at the same time. This will stimulate and improve your blood circulation, and it will also work the knots and tension in your muscles. Another advantage of using this model is that it has a wide and low design. This design makes the unit very stable to use, and you’ll be able to keep your feet comfortable even if you place the foot massager on a shiny flood surface. The Neckteck foot massager works silently, so you will be able to use it in an office if you want to. 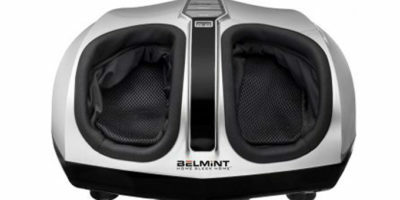 Thanks to its quiet motors, your coworkers won’t even notice the massager unless you point it out to them. A good thing about this model is that it’s very easy to use. You can turn the unit on or off using the button placed on its front. Once the unit is turned on, you can select the massage mode you want using the small button that’s closest to you. You can activate and deactivate the massager’s heat function when you want. The heated massage will spread pleasant warmth across the soles of your feet within minutes after you activate it. The heated massage will improve your massage experience, and it will reduce the fatigue and tension in your feet. Another good thing about this model is that it has an adjustable height. The small feet that hold the unit have 3 height levels you can choose from. This is a good feature, as it will allow you to adjust the unit’s height according to the height of the chair, armchair, or sofa you’re sitting on. Adjusting the unit’s height will allow you to keep your feet comfortable no matter where you’re sitting. Adjusting the front or the rear legs’ height differently from the others will also give you the possibility to increase or decrease the unit’s inclination, making it more comfortable for your feet. The unit’s small and compact design will allow you to move it around the house with ease. The foot massager is light, and you’ll have no problems moving it from one part of your house to another. 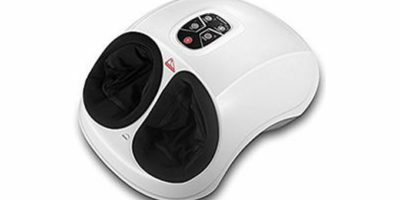 The Nekteck foot massager comes with a 12-months warranty. The manufacturer will repair or replace any unit that presents a workmanship or material defect within this period. For more information about the warranty, contact the manufacturer’s customer support service. Thorough Massage – Even though it has a small and compact design, this unit is capable of producing a very thorough foot massage. The 18 massage nodes the machine uses will cover the surface of your feet well, and their movements will relieve your muscles. Good Heating Feature – The heated massage feature used by the Nekteck massager is very good. You will be able to feel the warmth spreading across your feet within minutes from activating the feature. Feet Can Slip Off – The cut-out footprints don’t stop your feet from sliding during the massage, so your feet can actually slide off the machine if you’re not careful. Massage Xpert Copyright © 2019. All Rights Reserved. massagexpert.net is a participant in the Amazon Services LLC Associates Program, an affiliate advertising program designed to provide a means for sites to earn advertising fees by advertising and linking to amazon.com.